My initial trip to Sierra Leone in 2003 was spent largely in Freetown, mulling over research possibilities. I focused on the idea of studying Makeni because it was stigmatized, though it was a regional capital city. From that moment, everyone I met in Freetown, from the U.S. ambassador to university professors, dispensed advice on working in Makeni. The majority warned me to stay away altogether. They related what I would find when I arrived: a dangerous place, full of thieving youth, shameless rebel collaborators, arrogant RUF commanders ... a backward town, morally corrupt and ideologically marginal, harboring the dregs of society, the criminals whose tolerance of violence turned a rebel insurgency into a bitter, interminable standoff. On the whole, Freetonians reviled Makeni because of the occupation, which was viewed as iconic proof of the township's perpetually antagonistic relationship with the rest of the nation. Receiving these admonitions politely, I resolved to experience the town with an open mind, cognizant that strong feelings dominate thinking about Makeni. I had touched on an issue about which no one was neutral, though the issue was formed in a confluence of historical events, and not just the war. In short, from the beginning of the colonial administration of Sierra Leone, Makeni was its most economically, developmentally, and politically marginal and vulnerable urban center; in essence the "least loved," most precarious place to live in a nation characterized by the precariousness of existence. As one of my interlocutors explained it, "Makeni was never loved like Bo or Kenema. You can see this in how poor the town is." Lack of love and poverty become conflated: the town is poor because the rest of the nation does not love, and hence nurture it, and the nation does not love Makeni because poverty hampers its participation in the national development project. Lack of nurturing is both cause and consequence of marginalization. Without the ability to reciprocate, there can be no display of gratitude. Without gratitude, there can be no love. What residents of Makeni wanted, and what they lacked consistently under successive governments, was a leap of faith that begins with investment: they wanted government to take the first step in nurturing as a parent would with a child, and hope that the investment will pay dividends in gratitude. As neither side had taken the first step, the town and country were at an impasse. This was difficult to see in the immediate wake of the war, when aid created a boomtown atmosphere and carefree largesse was rampant. Makeni in 2003 was undergoing the largest demobilization and reintegration effort in the northern province, the second largest in the country. Young men were pushed through skills training hundreds at a time, six months at a stretch, and the town's economy benefited from their casual spending of transition allowances. The bulk of ex-combatants were in relationships with local women, and their money flowed through their girlfriends and wives to their families. With money present, everyone in Makeni gained from the generosity of someone else. The hateful selfishness purported by residents of Freetown seemed absent. Once the international community retreated, however, the prioritization of nested relationships became more obvious. Individuals became careful rather than carefree-in essence, with fewer resources available, maintaining the most important relationships mattered, and the obvious gifts of bounty that occur with plenty disappeared. Many petty relationships broke down, but it was those that mattered-the marriages that produced children, as an example-over which people fretted and sacrificed. As people could not nurture through large investments such as school fees, tokens of love-important because of the sacrifice involved more than their monetary value-became the order of the day. But how far can a little bit of money or a shared meal go in sustaining families, or pursuing dreams? Can small acts of love maintain a social world? As residents discovered long before the war, mutual love cannot occur without investment, and this is also true on the scale of communities and states. Makeni did little to participate in the national development project because it was poor. It was poor because it had always been an accidental town, unincorporated into the ethos of the nation, and because it was betrayed by its first political hero, the dictator Siaka Stevens. Makeni was, in essence, the unwanted stepchild. This was not a natural state of affairs. Rather it stemmed from the notion that Makeni had nothing to contribute. Bereft of natural resources, the town grew on the vagaries of trading and transport, tying its fortunes to the market rather than a base of production. It was more prone to drought and crop failure than other parts of the country, and because of the early conversion of many local people to Islam, was attractive neither to missionaries nor British administrators for education and development. After Sierra Leone achieved independence, successive governments blamed Makeni for its own "backwardness," speaking derisively of residents' tendency to think in terms of their intimate relationships rather than contributions to the nation. "Makeni people care about money and not education," is a common trope. It speaks to someone who thinks about feeding their family, but not nurturing a future doctor. As a consequence of consistent neglect and tribulation, the nurturing that Makeni's residents did for each other was small-scale and immediate. Their ability to practice love was limited heavily by their poverty and economic uncertainty; one can literally see a person's poverty in how they prioritize their many relationships and the nurturing they can accomplish. One may be asked to share in a meal but not a harvest. A parent gives a child clothes but not school fees. Resources must be carefully divided amongst chosen loved ones; the greater the number of relationships, the less each person receives. Sometimes the effort of nurturing is more than one person can handle, given their own small resources. An elderly farmer who decided not to exert his last efforts planting rice one season did so because he was tied to too many people. If he tried to feed them all, everyone would receive very little. At the end of the day he would have "planted hunger," and it was better for each person to try to feed himself than for him to disappoint his loved ones. If you have anything, you must share or risk sparking feelings of betrayal. He chose instead to avoid their anger by having nothing himself and hoping they understood. The rest of Sierra Leone views Makeni as marginal because the residents often prioritize their family and friends rather than the nation. The common wisdom is that as a regional capital, Makeni should make an identifiable contribution to national welfare. What is missing from this judgment is an understanding of the invisible everyday poverty that masks sacrifices people make for each other. The consistent threat of destitution and hunger generate different criteria by which people judge each other. Nonresidents' lack of familiarity and empathy with the tremendous cost of small-scale nurturing leaves the town open to being judged on the fact that, during the war, people cared more about their own families and friends than they did about what the rest of the nation wanted. In their narratives, residents emphasized the rightness of concentrating on family, directly challenging the rest of the nation for failing to embrace this. To be acceptable to the rest of the nation during the war would have required a wholesale rejection of the RUF, in essence, an uprising. Such a townwide effort was impossible: residents were so demoralized and jumpy due to the constant threat of attacks and internal fighting that, according to one person, "any sound of gunfire caused us to hide under the bed!" Instead, everyone closed ranks around their most treasured people, choosing to save themselves and their families by acquiescing to occupation. The repercussions were harsh. To understand how this process unfolded requires delving into exactly what Makeni is as a place, who lives there, and how the ostensible willingness of residents to accept ex-combatants was a predictable outgrowth of existing marginalization. When asked to prioritize saving their loved ones or ending the war for the country, most everyone chose, in Andrew Oldenquist's words, their "naked" loyalties: family and friends. Just as Sierra Leone was an artificial construction of colonialism and politics, so love for the nation was a secondary, more cerebral consideration than the primary impulses of family. Nationalism would have been stronger, perhaps, if people felt they belonged to the nation. If trade were utterly reliable as an economic pursuit, Makeni would be wealthy beyond residents' wildest dreams. The center of town is dense with markets and storefronts selling every ware imaginable. If the movement of people could make a place wealthy, Makeni would not have a trouble in the world. From the center of Makeni, one can proceed on a direct route to every other corner of the country, making it the nation's internal transport hub. Everything about the town itself reflects the constant movement of people and goods that define its identity as a trading center, but also define its fragility, how susceptible it is to swings in market demand and thus to poverty. The town's iconic center is Independence Square, from whence one can travel northeast to Kabala, east to the diamond area of Kono, south to Bo, and west to Freetown. Just off this square is the lorry park, a plot of land surrounded on all sides by stalls of wholesale and transit-oriented goods, teeming at all hours with hawkers, taxis, motorcycles, and travelers. Framing the town to the north and south are two large hills that dominate the landscape. Residents think of them as a married couple, cradling and nurturing the town, physically defining a permanence of place that cannot be achieved by buildings alone. The larger of the two, a solid mass of granite emerging from the ground, is Wusum, the male hill. His mate, Mena, the female hill, rolls gently along the highway, dotted with trees, vegetation, and boulders. The town's population is contained loosely by these hills, but otherwise spills out in an unplanned jumble of construction, ranging from mud-brick and thatch huts to multistory concrete edifices. Most of the new construction lines Azzolini Highway (named after the first Catholic missionary to arrive in the town in the 1940s), which runs between Freetown and the mining town of Kono, and cuts between the two hills. Large commercial structures hover over the road, hoping to attract custom from travelers looking for food, accommodation, or gasoline. Much of the actual activity on the roads takes place along their verges, where children play, women sit with baskets of produce, and laborers wheel overloaded carts of wood, rice, and other sundries into town. Much of the wheeled traffic on side roads consists of commercial motorcycles, which rose in popularity after the war because they negotiate poor roads with greater ease than do their four-wheeled counterparts. Along with houses and shops, in various states of construction or decay, the streets and small waterways are lined with tiny "kitchen gardens," the opportunistic growing of rice and vegetables wherever a seed can take root. Chickens, goats, and sheep peck and browse between buildings and among voluminous piles of garbage, often fighting semiferal dogs for the chance to do so. Nights are pierced by the snarls of dogs battling each other for the day's waste. The town does not look wealthy, or healthy. Aside from the flies and putrid puddles advertising a lack of waste disposal, many crumbling buildings, pockmarked with scars of war and time, stand waiting in vain for intervention. Most of the new construction is commercial properties, the majority of them owned by absentee landlords trying to profit from the safe distance of Freetown. Children play in the flooding created by the garbage-choked drains when the annual rains arrive. The rest of the year it is oppressively hot, and prone to the abrasive, invasive dust that annually sweeps off the Sahara with the Harmattan wind. People seek relief in scant shade; many of the trees have been felled for firewood and construction, leaving the landscape largely barren of green cover. The fruit-bearing trees are usually spared the axe, and when in season, the glut of fruit presages outbreaks of intestinal diseases, as flies feed off rotting peels and pits. With water supplies dwindling, households converge on the few wells deep enough to continue supplying daily needs. There is nothing comfortable or easy about living in Makeni. Every season has its own problems, every part of town susceptible to the same problems as any other. When I first arrived in Makeni in 2003, the population was estimated at two hundred thousand. This was remarkably high for a city that lacked natural or economic attributes: the density reflected the ravages of war more than a natural dynamic. The population was partially a reflection of an influx of displaced people who, having lost rural homes or livelihoods during the war, hoped for waged employment. Many were ex-combatants who disarmed in Makeni and decided to remain in town. Others were attracted by the commercial possibilities inherent in the influx of aid organizations, still others for the prospect of employment from all of the above. In many ways, the population grew because of the possibilities inherent in having so many people in one place. The town was founded by a group of elders from the Temne people, whose ancestors migrated south from Guinea several hundred years ago. Up until the war Makeni remained largely Temne, with a sizeable minority of Limba people, whose villages dot the landscape north of the town. Other ethnic groups represented-Fula, Kuranko-came largely as seasonal traders, or to take advantage of the educational opportunities that first arose with the Catholic missions. Though the war began in 1991, it reached Makeni first in the form of refugees from the south and east, who contributed a sizeable population of Kono, Mandingo, and Mende people. Though many of the displaced returned home and the Temne once again assert their dominance, the town retains the cosmopolitan feel of a metropolis. Unless one is certain of someone's ethnic background, all conversations begin in Krio, the national lingua franca. Temnes are known as keen traders. Early colonial accounts of the town marvel at the resourcefulness with which trading took place, from tailors setting up shop on their verandas to small girls toting wares on their heads, circulating through town. One can find anything from tomatoes to automobile parts in the central market, where there are also bustling trades in used clothing and the local batik and tie-dyed textiles. Those without access to market stalls set up shop wherever space is available; often people start their trading with small boxes from which they sell candy, matches, and soap. The glut of traders causes stiff competition, so profit margins are slim and traders work to turn customers into padi-friends. Affective ties, more than shrewdness or chance, keeps one's income reliable, if not large. The town is politically scarred; residents are largely loyal to a party that for many years humiliated and ignored them. It is nearly impossible to walk down a street without seeing a flash of red, the color of the APC. In the years after independence, the party became attractive to Temnes who had been excluded from the Mende-based political sensibilities of the SLPP. Residents voted en masse for Siaka Stevens in 1968 and hoped he would reward their support with development projects, even as it was clear that he was using his presidency to eat. In 1977, several cabinet ministers defected. Objecting to Stevens's ironfisted control of the political landscape, they formed their own breakaway party, the United Democratic Party, and held meetings in Makeni. Stevens punished Makeni violently, as he saw the mere hosting of an opposition party as personal betrayal, an act of disloyalty deserving punishment. He publicly withheld key development projects including a new power station, and admonished residents that he was punishing them for being ungrateful and disloyal. Stevens solicited residents to beg his forgiveness. In spite of both Stevens and his successor Joseph Momoh neglecting the town, residents steadfastly support the party not because of its policies-Sierra Leone's political history is one of "hometown" politics of in-group development-but simply out of fear that their fate would be infinitely worse under an SLPP government. This is the essence of negative love, of clinging to the least of all possible evils. I conducted the bulk of my fieldwork between May 2004 and August 2005. The town was replete with foreigners, as the aid boom was in full swing. Many people mistook me for NGO staff until they noticed that I did not have a vehicle. They then assumed joyfully that the Peace Corps was returning, and I was the sign of more volunteers to come. There ensued several months of patient explanation that I was a student rather than an aid worker, and that my purpose was to research the history of the town and its people, especially with respect to Makeni's awkward postwar position. Knowing my occupation and interests was not enough for residents to understand why I was living in Makeni. They had to make sense of why I would choose, of all places in Sierra Leone, one of the poorest in which to live and work. The implicit consensus was that I sympathized with their plight vis-à-vis the rest of the nation; that I loved Makeni more than any other place. I was therefore their own anthropologist and historian, living in Makeni in order to write the truth of their story for the world. People spoke of me as their defender; I was even introduced to their member of parliament as "our anthropologist." The implications of this for my work were profound. Rather than struggling to find interlocutors, I was a magnet for individuals eager to tell their stories. I spent most days walking around town to attend events or hang out with acquaintances, and I was often greeted by a new person who was curious about my work and wanted to offer his or her own story. I spoke to many of these people, but was unable to sit down with all of them. I spent time observing classes in the schools, meetings at the town council, religious events, graduations and ceremonies, and political rallies-and just hanging out with people. My concerns about the social stigma that might result from my speaking to former rebels, soldiers, and other combatants were unfounded, as these people were viewed as part of the fabric of the town, judged as individuals just like everyone else. The ease with which I recorded life histories, especially with respect to war experiences, implies that residents of the town were acutely aware of the stigma they faced in the country. They wanted to be heard and validated-a story is not real until it has an audience-but they also wanted to defend themselves against accusations of collaboration with the rebels and the accompanying stigma of being traitors to the nation. They viewed me as their mouthpiece. I did my utmost to do justice to them and to the project of understanding love as a social framework by telling their stories, all the while being aware of the fact that narrative is a political tool by which people justify their actions. If Makeni was "backward" and unloved, residents were happy to explain that the government was at fault. After all, they were not in a position to provide electricity, running water, paved roads, and public buildings on their own. A government that shirks its responsibilities towards its citizens must be publicly proclaimed wicked if it is to see the error of its ways and return to practicing love. It was clear that residents were not proud of Makeni. Comments regularly flew about how "backward" Makeni was compared to the other regional capitals of Bo and Kenema, both of which had grid electricity and paved roads. Residents claimed that no government ever loved Makeni as much as it loved the other two towns, feeding Makeni only the last and least scraps of development. Extensive archival work revealed that from the beginning of the colonial administration of the protectorate in 1896 to independence in 1961, the town was never as nurtured-with resources and investment, or with development and infrastructure-as the other two towns to which it was frequently compared. Makeni is slightly north of the geographical center of Sierra Leone. It is not in the belt of rainforest that dominates the southern and eastern parts of the country, nor is it technically in the arid, cooler north, where lower densities of mosquitoes and tse-tse flies make raising cattle possible. It is in an open wooded savannah, where for most people, mixed crops of vegetables and tubers are the most reliable food source. The area is covered with the seasonally flooded swamps known as boliland, in which, with tremendous effort, rice and other floodplain crops can be grown during the annual rains that fall between May and September. It lacks, however, a feature that was critical to initial administrative decisions about the suitability of the area for agriculture: rivers. The British colonial administrators who arrived at the end of the nineteenth century were keen to use the country's hinterland for crop production and resource extraction. They found the south and east suitable for growing tree crops and harvesting timber. The rivers that flowed extensively through these areas and the northwest also made them attractive for the introduction of mechanized swamp rice farming. Makeni had neither rainforest nor rivers, so very little agricultural infrastructure was introduced, aside from some abortive attempts to produce cotton. There was, however, a demand from Europe for palm kernel oil, which prompted the administration to build a railroad to transport kernels, stopping at a point equidistant from the largest palm groves. Palm kernels were plentiful in the north, and the place chosen for the termination of the railroad was Makeni. The town grew as traders and transporters flocked to the booming economy. The problem with boomtowns is eventual bust. The railroad was planned in 1896, when the demand for palm kernels in Europe was astronomical. By the time the rail line was complete in 1916, demand had subsided, and palm kernels could be extracted at considerably cheaper cost in Southeast Asia. The trade in Makeni senesced, and so did administrative interest. As the area was not contributing anything to the colony's exports, there was no need to invest in physical or human infrastructure, no matter the size of the population. Development such as roads, schools, and hospitals were largely absent for the next thirty years. Makeni was treated as an accidental town, an area of no strategic importance because it contributed nothing to the productivity of the protectorate. Only the fact that its population continued to swell forced the administration to take notice. It was given the status of northern regional capital in 1948, when it was the second-largest urban center outside of Freetown. Hospitals and administrative structures were built slowly, and always after similar structures were well in place in Bo and Kenema. The latter towns were booming centers of large-scale production and trade of rice, timber, and diamonds. Makeni, by contrast, produced nothing. In 1949 an edict from London essentially forced the administration to deliver the same legal structures to Makeni as were already in place in Bo and Kenema. Even though Makeni had been granted regional capital status because of its population, the administration in Freetown overlooked it as site for a policing system, and instead installed one in a secondary town closer to the diamond region. This is only one of many examples of Makeni not being loved by the administration because it was not contributing, a dynamic which resonated with the system of loyalty politics of nurturing and withdrawal practiced by Sierra Leone's governments since independence. The administration on its own could not fully colonize Sierra Leone. Britain relied heavily on missionaries to establish schools, promote religious conversion, and pave the way for administration, extraction, and development in the hinterlands. Makeni was again disadvantaged by its physical location: relatively close to the Guinea border and within the traveling realm of the seminomadic Muslim Fula traders. Much of the Temne population was Muslim by the time of administrative incorporation into the protectorate. Feeling that conversion was more likely among the "animist" populations than among those already converted to a monotheistic religion, Christian missionaries congregated in the Mende south. Missionaries built critical infrastructure such as schools and hospitals, and the presence of expatriates in the south and east encouraged the government to supply the areas with roads. Makeni did not receive its first permanent missionary presence until 1950, when a group of Xavierian priests led by Father Augustus Azzolini arrived. His order built St. Francis School in 1951, added a junior secondary school in 1955, and a senior secondary school in 1958. At the time St. Francis opened, only two hundred children in the region attended school, most of them at the iron ore mine complex in Lunsar. By this time, the Bo School for Boys had been training the sons of the southern elite for almost fifty years. Though initially responsible for Makeni's population explosion, the railroad became more of a hindrance to development than a boon. By the time it reached Makeni in 1916, palm oil prices had dropped to the point where the railroad struggled to break even. The administration hoped to make money by converting the trains to carry passengers. As a last-ditch attempt to make a failing transport industry profitable, the administration refused to connect Makeni to the protectorate's ever-growing road system, hoping this would force people and freight onto the train. Minutes from meetings of the roads boards from the 1930s show that the suggestion to link Makeni up to nearby protectorate roads was consistently tabled, as such a road would absorb traffic that would otherwise use the railroad. The suggestion to attach Makeni to the rest of the road system by toll road was bandied about for several years. Not until the early 1970s, when a plan to dismantle the railroad was already in the works, was Makeni linked up by road directly to Lunsar, a mining town less than seventy miles away. Makeni residents found themselves politically disadvantaged at independence in 1961, when Sir Milton Margai, a Mende doctor, became the first Prime Minister under the banner of the SLPP. Margai wanted a unified nation, but his untimely death meant his brother Albert-known to be more "tribal"-assumed office. Unlike Milton, Albert restricted his cabinet to trusted Mende advisors. Siaka Stevens formed the APC as a counter to the Mende tribalism of the SLPP, and it became a coalition party of the Krio, Temne, and Limba. Stevens obscured his own ethnic heritage, which allowed him to court the loyalty of multiple tribes. He curried favor in areas of the country where his popularity was not assured by his Temne-Limba leanings, and so, paradoxically, under his rule Makeni also received the last and least bits of development. Stevens punished the town after the political defection of his ministers in 1977: the UDP was demolished by Stevens's thugs and its leaders imprisoned and eventually executed. Stevens required a public apology from residents before admonishing them that the development of the town relied on their "self-help" measures, which the government would consider supplementing. In essence, he abused practices of love to chastise and shame the town. Residents were elated when Stevens retired in 1986 and named Joseph Momoh, a Limba from the nearby village of Binkolo, as his successor. They assumed that, as he maintained family ties in Binkolo, Momoh would participate in political favoritism-hometown politics-from which Makeni might benefit. Momoh appointed several Makeni natives to key positions in his ministries, however it was soon clear that these appointments were rewards for Momoh's inner circle, rather than acts of love for the town. On his first visit, the new minister of state presidential affairs reiterated that he was not a servant of Makeni, but of the nation, as was the president himself. Residents must stand behind their president, but they could not expect the town to benefit. According to one resident who served on the town council, this was a veiled warning that Makeni needed to prove its love first before it would receive development. Indeed, Momoh did not grant the town any infrastructure projects in his five-year tenure as president. My interlocutors who remember his presidency took this extremely hard, as, according to one, "We did not know why our own son would not help us. We always stood behind him." In this all-too-brief history of Makeni between 1900 and 1991, there is a pattern of consistent, deliberate neglect because of vagaries of history and geography: riverless, Islamic, resource-poor Makeni held no attractions that would make investment, and thus building bonds of love, worthwhile for any administration. The town was never nurtured partially because residents scrambled to support themselves, produced little, and through forces of circumstance, contributed very little to the colony, and later to the nation. Nurturing is a two-way street, and administrators and politicians expected residents to contribute first. Inhabitants yearned to belong to the nation, but they were weary of apologizing for prioritizing their families and of begging for investment. The only relationship they inspired was the negative kind: punishment for falling out of line. Education was an uncomfortable fit for Makeni residents because it requires long-term sacrifices of both money and manpower that could otherwise be used in business to support families. Successive governments pushed education with a diffuse notion of training leaders for the nation, with rewards delayed until students secured precious jobs, from which money and security would eventually return to the family. However, jobs were scarce and few families could invest in schooling a child. Education made little sense in the resource-restricted space of interpersonal care defined by poverty; by sending a single child to school a mother hampered her ability to nurture the rest. As a trader who trained her daughters in the market stated, "If I teach my daughters business we will earn money together for our family until they get married. If I put them in school, they will cost us money from now until they get jobs, and we will eat little. And there are no jobs." Makeni residents had little to give each other and less to give the nation in the wake of the war. This did not make them bad people, or "backward." With fewer resources, every act of nurturing required greater sacrifice. Those sacrifices were made on behalf of one's naked loyalties, and not the state of Sierra Leone. Residents believe that, in contrast to their own lack of resources, Sierra Leone had much to give them-as evidenced by the fact that Bo and Kenema had all their schools rebuilt by the end of 2004. What they could not understand was why the government did not invest in the town; hence the feeling that they were being forced to be loyal out of fear that their small concessions would be lost, because they had nothing to offer that would inspire love. They were adamant that the catch-22 could only be solved by the government making the same sacrifice the trader could not justify for her child: invest first, and give slightly less to other regions. Whatever that investment, Makeni would never have as much to return to the nation. Hence, there was little logical reason for the government to give, and it was right that Makeni should be behind. This paradox is one of the primary frailties of love, and it creates feelings of bitterness, whether in war or in ordinary times. Though rebel forces did not occupy Makeni until 1998, residents felt the effects of war years earlier. Once the NPRC coup took power, it purged regional administrations of APC politicians. The coup, run by young officers with an agenda of political reform, was initially popular. Unlike most previous governments, the NPRC officers lacked clear regional or tribal leanings. The coup assigned officers to administer each region, and, aside from some arguing over the fact that Makeni was not allowed its own civil militia, the town was fairly calm throughout the initial years of the regime. The refortified army dedicated itself to fighting the RUF, and for the first years of the junta, tribal and regional differences were cast aside as the nation pulled together to fight the rebels. All of this changed, however, with the peaceful transfer of power from the NPRC to new SLPP president Tejan Kabbah in 1996. Kabbah opened his presidency with a national tour, during which he addressed the emotional issue of the war. For most towns his words were encouraging. For the people of Makeni, however, he saved vitriol. Citing the fact that Foday Sankoh and one of his commanders were from the north, Kabbah told the assembled crowd that the people of the north-and therefore Makeni, as the capital of the region-were responsible for the war and owed the rest of the nation an apology. Intellectuals from Makeni reacted violently to what they referred to as "the Hail Theory of War," citing multitudinous facts, from the physical origin of the war in the south to the largely APC sympathies of the north as counterarguments, but the protests fell on deaf ears. Writers from around the nation cheered Kabbah's willingness to galvanize the country's sympathies against the RUF. Though the south and east may have gained new resolve, the consensus in Makeni was that it was being scapegoated. Kabbah's speeches were not enough to keep everyone happy with the government. Within a year the Armed Forces Revolutionary Council (AFRC) seized power. This coup was a combined effort of the RUF and mutinous members of the Sierra Leone Army, which had fallen out of favor with the government. Kabbah had encouraged local civil militias to take up the bulk of the fighting on behalf of the government, and followed up this call to arms by slashing army salaries and rice rations. Cast out of government favor, many bitter soldiers were vulnerable to the RUF call to take matters into their own hands, and they succeeded in chasing Kabbah from Freetown in 1997. His government-in-exile in Guinea gained the cooperation of the ECOWAS to retake power early in 1998. Once he returned from exile, Kabbah concentrated his military efforts on fortifying Freetown and protecting the towns of Bo and Kenema, leaving only a skeleton crew of Nigerian troops in Makeni. The RUF attacked Makeni on December 23, 1998, and after a skirmish in the barracks, the remaining Nigerian troops fled. With no other force to protect the town, it was taken easily by the rebels. The occupation of Makeni lasted three years. In 1999 and 2000, residents cowered in terror as various groups of rebels vied for control of the town. Some groups were comprised of mutinous soldiers led by opportunistic RUF commanders. Others were groups of "real rebels" taking orders from Foday Sankoh himself. Nowhere in this time did Kabbah order an invasion to liberate the town, even as one of his ministers assured residents of Makeni just four months into the occupation that the town would soon be rescued. Those promises came to nothing. Citing the starvation that was occurring, NGOs engaged the RUF in conversations about providing humanitarian aid in the town as, simultaneously, the government suggested peace talks. The RUF gained political legitimacy with these overtures, which treated them as a force to be negotiated with, and they thus had no reason to end the occupation without real concessions. The occupation continued, and residents were in a bind. Those who remained were immobile for various reasons including infirmity, lack of family elsewhere, and the prohibitively high "tax" levied on fleeing civilians at RUF checkpoints. Not knowing if or when the town would be liberated, people did their best to survive the daily indignities of living under occupation. The more people an individual took responsibility for, the more they were required to interact and cooperate with rebels, who controlled most of the resources in the town. In short, the greater the number of relationships individuals had, the more they were vulnerable to criticism of happily "collaborating" with rebels. Foday Sankoh signed the Lomé Peace Accords in 1999, and used the accords as a political tool to further alienate the country from Makeni. In November he visited Makeni to ensure people that the UN troops stationed in the town were there to maintain security as peace took hold. He stated that he was not prepared to fight again and that the combatants would disarm. For a month after his appearance in Makeni, he jockeyed for leverage with the government by asking the United Nations to leave Makeni, arguing that residents were more comfortable with RUF security than that provided by foreigners. He cited the fact that residents were celebrating the day he arrived on his national tour to promote the peace accords as proof that they were all rebels, which was soon refuted in a statement issued by residents. They felt Sankoh was deliberately trying to maintain the RUF headquarters in the town, so that if the town were disowned completely by the rest of the country, he could carve his own fiefdom out of the wreckage. A week later, a government press release announced that the northern region was the only part of the country being excluded from an international aid plan, because its security situation was not up to standard. Because of Sankoh's statement, Makeni received no humanitarian relief. Despite the lack of aid, the United Nations moved military observers into the town to set up disarmament camps. The camps were designed to provide fighters from all factions a place to hand over their weapon in exchange for protection, shelter, food, and a disarmament and transition package. Several RUF commanders in Makeni were not invited to Lomé for the peace accords and feared that Sankoh was selling them out for his own benefit. They rejected disarmament, and in March 2000, RUF cadres surrounded the camps demanding the return of their "kidnapped," disarmed brethren. In one night of siege, they killed fifty Kenyan peacekeepers and took over one hundred more hostage. They destroyed the camp and rekidnapped seventy-two child soldiers. Kabbah was enraged, and highlighted this in a radio broadcast as proof of the residents' collaboration with the RUF-and proof that Foday Sankoh had spoken the truth. To rid the nation of this blight, he would bomb the town to bare ground. The government had a single helicopter gunship, which was flown by a South African mercenary. On its first trip to Makeni, the gunship distributed propaganda. It flew low, showering the town with leaflets titled "Lion News." "Lion News" was touted in the newspapers as instructions for rebels on why they should disarm and exhorting the benefits of peace. The leaflets themselves paint a different picture. The threatening nature of these exhortations sparked a mass exodus from the town, a "pathetic human chain to nowhere" of over thirty thousand people, including the old, infirm, and starving, who left a town under threat of imminent death without any idea of where they would go. The propaganda drop was followed the next day by a series of bombings, which lasted for several weeks. The bombing was the final damaging event in the relationship between Makeni residents and President Kabbah. By sending the gunship, Kabbah stated unequivocally that he believed Makeni had betrayed Sierra Leone and deserved punishment. This action enabled the RUF to portray itself as the rational, positive alternative. Though residents had wavered on the point of whether or not the government loved the town enough to liberate it, the wholesale destruction offered by the government left no doubt in people's minds that the relationship was unsalvageable. The RUF seemed reasonable and compassionate in comparison; they remained steadfastly in the town, offering instructions to people about when and where to hide when they heard the gunship, and resolutely remaining in charge, like a captain going down with a sinking ship. The bombing was the one instance where Kabbah forced residents to choose his government over their own families, in essence stating that the nation should be residents' primary love. This is an extraordinary idea: that the president was somehow sovereign and could demand such love in a democracy. By gathering their families and leaving the town, residents proved that Kabbah could not force this; they would not be stripped of their status as citizens and forced into a new state in which they possessed only Agamben's "bare life" and could be killed without conscience. They fought back by leaving the town, even as this resulted in the abandonment of dying children, the elderly, and the sick by the side of the road. The abandoned were mute testament not to the indifference of their families, but to the outright cruelty of the president: these were the people for whom the strong stayed in Makeni, and now it was the president who had forced their deaths. The RUF, remaining in Makeni and running the town as usual, was not subject to such accusations of betrayal. People did not suddenly love or support the RUF, however Kabbah made the rebels appear the more rational of the two adversaries. If it is true that Makeni people felt some affinity with the rebels, it only became true when Kabbah destroyed all possibility of love for his own regime. Whether or not individuals cooperated with the rebels during the occupation, Makeni struggled to shrug off the stigma of collaboration in the aftermath, once ex-combatants had been reintegrated. Reintegration was designed to retrain ex-combatants in the locations where they disarmed, and return them to their natal villages with their new skills. Makeni's problem stemmed from the fact that most of these ex-combatants did not return home because they preferred urban life. Unfortunately for the town's reputation, this was interpreted by Kabbah as proof that residents were happy to have them; that they did not care what it did to their reputation to appear so welcoming to the men who had ruled their town for three years. There are many reasons ex-combatants chose to stay, stemming mainly from the fact that many combatants had been in Makeni for a long time, and had started families they wanted to be near. Ex-combatants were also aware that they would only find employment in their skills-especially in domains such as driving and mechanics-in urban areas. They could not return penniless to families who hoped they would shoulder the burden of caring for aging parents and younger siblings, and so they chose to stay in town looking for work rather than returning home ashamed and empty-handed. These former combatants themselves defended the townspeople against accusations of collaboration, and their perspectives came from many different angles. One ex-combatant spoke of the need to actively work on peace by not forcing anyone to uproot himself. The very act of expelling someone reveals a spark of anger in the heart, and this is anathema to peace: "When disarmament went on, [RUF commander] Issa Sesay told us that the war is over, so really everyone should try and go back home. So we were under that pressure. The paramount chief of this chiefdom, Chief Kasanga, outwardly told his people, his community, that we should not be driven. 'The war is over, the ex-combatants have disarmed,' he said. 'They have demobilized and reintegrated. If somebody wants to stay here, let him stay, because we are now under law. If anyone wants to stay and abides by the rules and regulations of the community, we will leave them alone. If somebody wants to go, if he does not want to comport himself to the rules of this community, then go. He should go away.'" He continued, "So the chief said that good people can stay, but we were under other pressures. At that time they were driving us from their houses, they said we should leave their houses. But Issa ... this is his hometown. So he was passing around the idea of peace, that we should not be driven forcibly, and at that time people loved him so much because he was nice to them during the occupation. So whatever he said, Issa, they took. So people were favoring him. Some people were not in favor of that, because they said that so many Temnes are scattered all over this country. So if the same is true, let these people come back and the Mendes should go. The special reference was for the Mendes; that we should go home. It was like cleaning the town. "So the paramount chief advised. He said no, that will not happen. If that happens, it will bring tribal conflict. This is a big problem and we don't want to bring it here. So as far as he is concerned, and this is his chiefdom, he will not allow that to happen. So we can stay here now, peacefully. Of course in any community there must be bad people. Some ex-combatants, they are wicked. And due to their behavior during the war, most of them did not stay here. They were afraid of their shadows. So most of them went home." There are two important points to note from this narrative. The first is that the speaker did not feel at ease, contravening the notion that residents welcomed ex-combatants. The second is his conclusion that an exodus of ex-combatants would appear to be an ethnic cleansing, as the bulk of the ex-combatants were Mende. The chief perceived this as potentially fueling ethnic conflict in the town while the Mende SLPP was in power, a result he wanted to avoid. In his estimation, the town would suffer greater condemnation for an ethnic cleansing than for letting ex-combatants choose their own path. Many did choose to leave, as they had families and dreams that they wanted to pursue elsewhere. The ex-combatant assumed that most "bad" people would end up leaving town of their own volition, as they had either gone crazy from the acts they committed during the war, or they had no friends at all in town, or both. Driving ex-combatants out would achieve nothing. "When we came out of the bush we made this place our headquarters. So people started talking, saying all Makeni people are rebels. They are all rebels because look: all the ringleaders were born there. So they are all rebels. So anything we do here they don't want us to succeed. But it can't be this way. The government can't keep blaming us and giving us a bad name because so many people didn't have anything to do with it. And because they blame them, the rebels, they are making sure that development and work don't come here, they are trying to make things difficult for us. We are trying to overcome that bad name; we are doing everything we can to prove to the rest of the country that it wasn't the fault of Makeni. Former rebels are moving back home, people are going back south ... but during the war, the chance wasn't there to go home. And we had a plan to go back but things after the war kept foiling it and we just sat down here." Civilians in Makeni were circumspect on why people stayed during the occupation, once it was clear that the rebels were in control. It was not easy leave the town, especially for those who lacked the infrastructure, people, and means to support themselves elsewhere. According to a teacher, "People used to come and go from the town when it was occupied, but under very difficult circumstances. You know, there are certain people who ... not that they did not want to leave Makeni, but I think they were looking at this from two schools of thought: where to go, and how to find a living. I think that was the concern of people. Those who moved, a good number of them did not even have a focus. It was like they just 'go for go's sake.' They follow others. When they see a particular group moving, they are left with no alternative but at least to follow them. That is how it used to happen. And for those who stayed, it is not as if they never wanted to move. They wanted to move but maybe they were old or crippled. How to move then?" "Some were having relatives ... one thing about Africa, people respect tradition. And they respect age. And it is a kind of insurance policy here: parents take care of you until you reach adulthood, and much is expected from you again in return. And if at all you have nothing to give to them, especially in relation to cash, or whatever, but if you have a way of staying around them, maybe you have to do that. I think they often appreciate that so much: your presence alone around them ... it means you have concern for them. And as a result, some people had to stay because of that, because they loved their parents. "Like myself, my dad was in M and I was in Makeni. But there was a roadblock between M and Makeni, and one could not venture to M. And even when I had left Makeni, I always thought: I had an obligation that I must come back to see my daddy. And I was told his condition was deplorable. So I went and saw my daddy, though I had to walk the whole way in very dangerous conditions. And he was not in very good health. I motivated him, I tried to make him see reason so that we go together, but he preferred to stay. He said, 'No, it is better if you go, I prefer to die here.' Old people ... they don't like to move! He said he had lived his life and it was fair for him to die, but I should leave and save my own life. So he stayed in M right through, he survived the whole thing! And the moment I got a teaching job in Makeni I came back to see him." Recalling Calvin's story in the Introduction, where he describes staying in Kailahun to care for his parents, the fact that so many people chose to remain in the town under occupation rather than scatter speaks to how love requires sacrifice that defies danger. The fact that residents allowed ex-combatants to remain, on the grounds that the decent people would stay and the bad would eventually purge themselves, is the natural rhythm of harmony restoring the social world: those who embrace relationships can stay. Makeni residents were acting resolutely from love in both instances, a more compassionate stance than that offered by those who frame the situation as one of collaboration and national betrayal. For Makeni people, anything could be endured if their loved ones survived. It did not matter who was ruling the town, as long as individuals could provide for their loved ones. It did not matter who stayed after the war was over, as long as those who did were good people. It was more likely that a fragile peace would be preserved if ex-combatants were not driven out in anger. According to the teacher who could not coax his father to leave, "I think Makeni people must be more liberal than other people. We do not just support someone in government because they are our tribe. You get Makeni people voting for the SLPP if they think it will bring good things. No one in the south votes for the APC. So maybe we are a bit liberal to accept the ex-combatants." In essence, it was the willingness of people in Makeni to remain true to the basic tenets of love-a faith that if someone proves they are "worth having" based on their willingness to nurture, they can be brought into the social fold-that placed them on the outside of a government where loyalty was based absolutely on tribal affiliation. As one of my Mende friends stated thoughtfully, "Loyalty to the SLPP party, it's like a religion among the Mende. You do it because that is where you belong, it does not matter what they do for you now, because the only way you will get anything in the future is if you stay with them. Kabbah was the big man in this party and he believed that everyone owed him this love because he was also the big man in the nation." In essence, loyalty to the SLPP begins as a negative relationship, as fear of being left out. People are steadfast in their hope that they can transform this relationship into one of love. Kabbah thought that loyalty to his government was a higher priority than love for one's family, with the result that this marginal, problematic town was one of the last places in Sierra Leone to receive relief aid at the end of the war. Makeni residents had not earned his nurturing, and so they earned his bitter disapprobation. 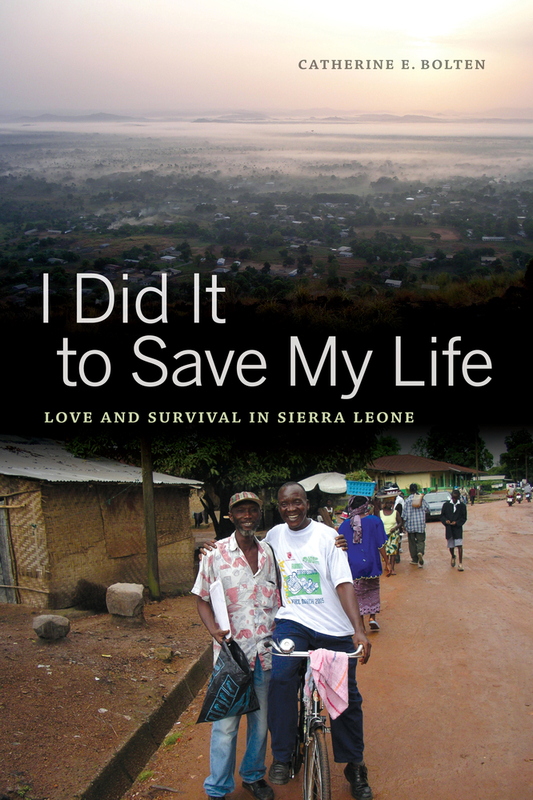 Utilizing narratives of seven different people—soldier, rebel, student, trader, evangelist, father, and politician—I Did it To Save My Life provides fresh insight into how ordinary Sierra Leoneans survived the war that devastated their country for a decade. Individuals in the town of Makeni narrate survival through the rubric of love, and by telling their stories and bringing memory into the present, create for themselves a powerful basis on which to reaffirm the rightness of their choices and orient themselves to a livable everyday. The book illuminates a social world based on love, a deep, compassionate relationship based on material exchange and nurturing, that transcends romance and binds people together across space and through time. In situating their wartime lives firmly in this social world, they call into question the government’s own narrative that Makeni residents openly collaborated with the rebel RUF during its three-year occupation of the town. Residents argue instead that it was the government’s disloyalty to its people, rather than rebel invasion and occupation, which destroyed the town and forced uneasy co-existence between civilians and militants. Studies at the University of Notre Dame.